Wearable Technology is the new revolution in Workers' Compensation and injury prevention on-the-job. As the use of technology and new access to various data in employee risk factors continuously expands, managers can improve workplace safety measures and reduce the number of one-the-job injuries. Consider these following products to benefit your workers' safety and Workers' Compensation costs. 1. SmartCap is a helmet lined with sensors that can detect fatigue. The sensors trigger a smartphone alarm to warn the tired worker. If the sensors detect that the fatigue is extreme then supervisors are contacted. Truckers have most recently begun using this technology in the form of a baseball cap. These sensors are great for shift workers, employees with long shifts, or jobs that entail rigorous physical activity. 2. Smart Helmet is a product built with a variety of sensors and cameras which allow the user to see 360-degree views from within the helmet. The product was designed for industrial settings in the hope that workers would be more aware of their surroundings and therefore cause less accidents or mistakes. The helmet also contains important information regarding safety protocols and guidelines if the worker ever needed to access them on the spot. 3. Proximity Warning Systems are audible and visual warning systems that reduce the risk of vehicle collisions on work sites. Onsite workers wear a transponder and vehicles are equipped with outfitted cameras and hardware to create safety zones. When the safety zone is interfered, the machine operator is warned and takes action to avoid the accident. 4. GPS-enabled vests are used for employees working with dangerous or heavy equipment and materials. 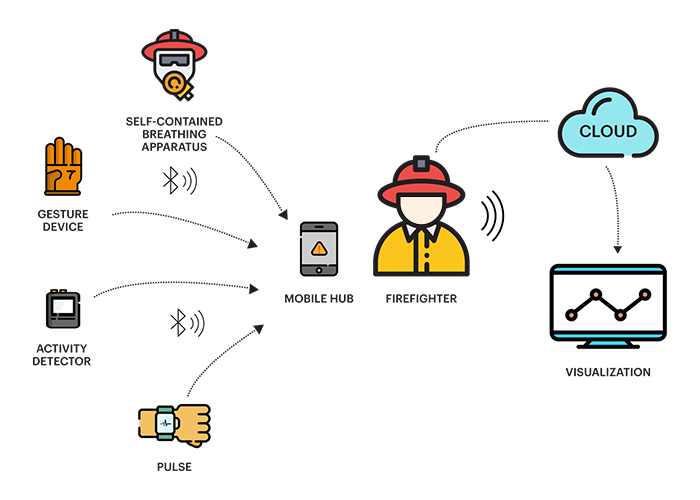 The Connected Worker System places sensors in a set of wearable devices that can measure heart rate, motion, gases inhaled, and certain physical gestures. The systems are being used to collect injury data so that companies can design their safety protocols more specifically. Contact Carriage Trade Insurance if you have any questions regarding your Workers' Compensation.